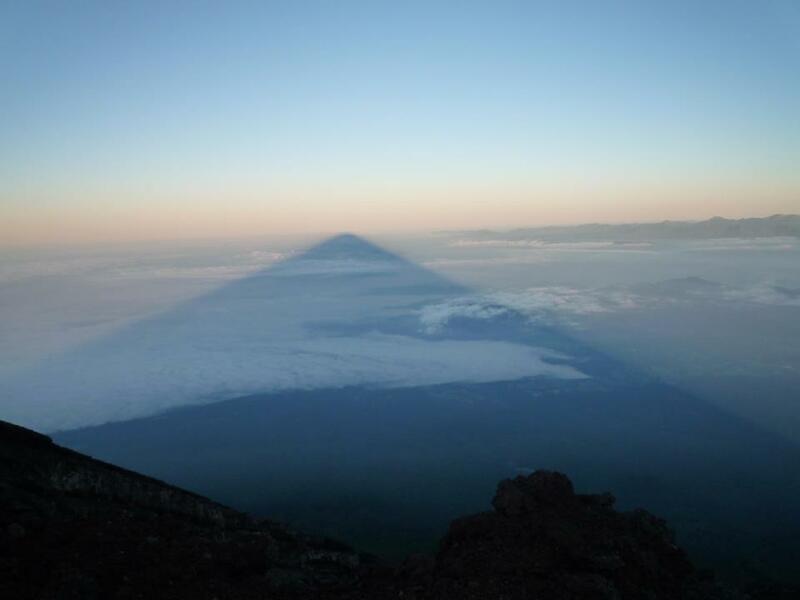 Shadow of Fuji, viewed from the peak at dawn. 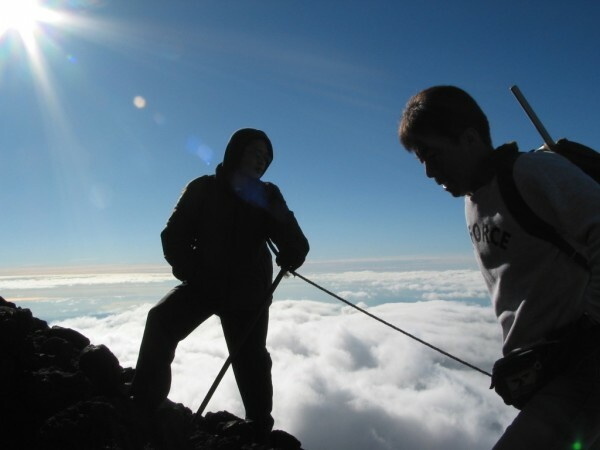 Climb Japan’s highest mountain, explore caves and be mesmerized by some beautiful waterfalls. Climbing Mt Fuji is a unique experience that probably less than 1% of Japanese people ever experience (this is probably a good thing). 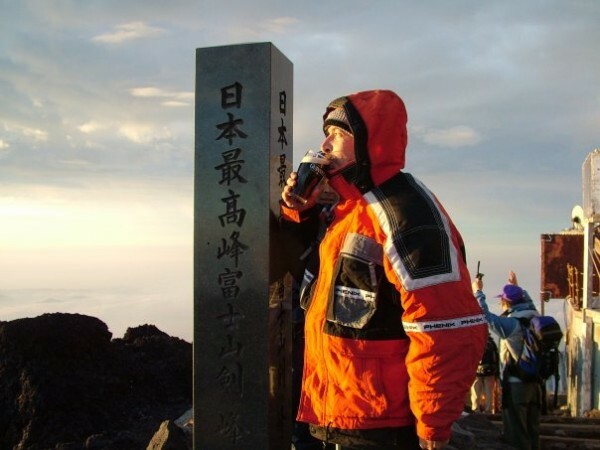 The old sayings are “If you never climb Mt Fuji you are a fool, and if you climb it more than once you are a fool”, and “Fuji-san is a mountain best enjoyed by looking at it, not climbing it”. There is a good deal of wisdom in both of those sayings, because the climb is brutal, and many people simply can’t make it to the summit. 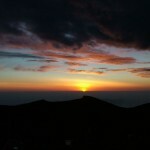 Sunrise, viewed from the weather station on the peak. This tour will begin with a visit (depending on the weather) to either Ryotanji temple near Hamamatsu, or Miho-no-Matsubara. Both are in Shizuoka. Ryotanji is a beautiful zen temple (with an exceptionally beautiful rock garden), and is the ancestral temple of the Ii family. Miho-no-Matsubara has recently been added to the UNESCO World Heritage list, and is famous for the fantastically shaped pine trees, and (on clear days) the spectacular views of Mount Fuji across the bay. 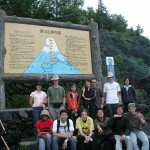 On arrival in the Mount Fuji area, time & weather permitting, we usually visit some caves. These are actually lava tubes dating back to ancient volcanic eruptions. Locals used these caves for centuries for storing ice, which could then be sold in the market towns near the coast long into the hot humid summer season. We usually stop for a fairly carbohydrate heavy late lunch, timed for about 3-4 hours before heading to Shin-go-gome. (If you have been on a relatively low-carb diet, switch to a higher carbohydrate diet at least 72-96 hours before the climb. Any weight you gain will be lost). It is a steep climb. 7-8 hours on average. 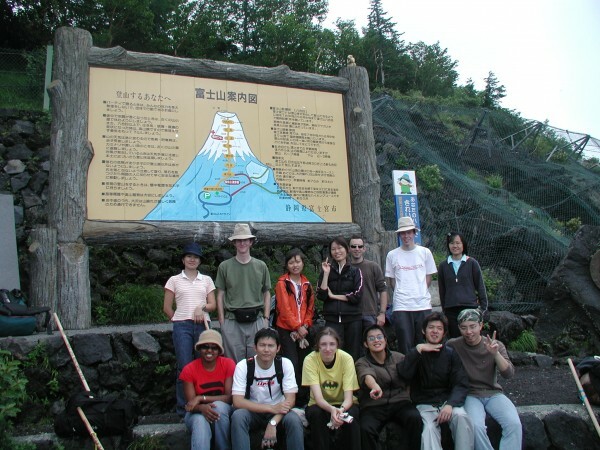 We will be taking the Fujinomiya route from Shin-go-gome, beginning the climb from about 2600 meters above sea level (ASL). We will stop at Shin-go-gome for about an hour to adjust to the altitude. Going from sea level to 2600 meters ASL in a matter of hours, and then climbing a very steep route to over 3700 meters ASL isn’t something our bodies have evolved to cope with. The secret to climbing this hill (as Declan calls it) is preparation. You need to be fit, have the right gear, and most importantly, be mentally prepared for some serious exhaustion and pain. At Shin-go-gome you may also want to purchase your walking stick here so that you can get the souvenir stamps on the stick that most walkers won’t have. You don’t really need the walking stick on the climb up, but it is extremely useful when coming down. The stick can also be purchased on the summit (it will be more expensive). The easiest part of the climb is from Shin-go-gome to Station 6. It is the shortest link, and involves the lowest climb in terms of altitude. It does however involve the most important part of the entire climb, the reality check. At the top, looking down into the crater. Clothing, equipment, fitness, whether you need to bandage parts of your feet etc. Don’t proceed beyond Station 6 if you have problems. Don’t proceed beyond Station 6 if your clothing is already wet/damp. DO NOT! From Shingo-gome (“new No. 5 Station”), we will climb past six other stations before getting to the tori (gate) marking the top of the route. For safety reasons, we will be climbing at the pace of the slowest hiker in the group. It will normally take 7-8 hours to climb to the top, usually/hopefully pacing ourselves to arrive just before dawn. Resting outside the Irish Pub at the peak*. The track is reasonably well marked and during climbing season the route all the way up is dotted with those climbing ahead of you or climbing down. The track is just that, so don’t expect well made boardwalks or stairs, it really is a wilderness area, and it is covered with snow and ice for most of each year. On this route, the climb from Stations 6 to 8 is brutal. Then from Hachi-gome (Station 8) the route begins to get even steeper, and by the time you get to Kyu-gome (Station 9), the track will almost be so steep and rocky that at times it will feel like you are rock climbing. A pair of cheap (disposable) gloves can be useful to protect your hands. You can buy these at convenience stores. It is however worth having a spare pair of gloves (warm and dry) to wear while at the summit, as it is extremely cold. Once above 3000 meters, some climbers might experience altitude sickness, and the only cure for it is to descend down if it gets severe. 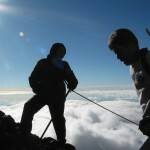 A relatively slow ascent is usually the best way to avoid altitude sickness. A slow shuffle. Frequent 30 second breaks to breathe in as deeply as you can. Large numbers of very short breaks are much more helpful than a dash to the next station followed by a long break. It is really cold on the mountain, and it is best to keep muscles warmed up, and to stay as dry as you can. Also, it is important to keep hydrated. A mouthful of water every 4-5 minutes (when above 3000 meters, make it every 3-4 minutes) or so, is better than a long drink at one of the stations. Depending on your condition, sometimes it is best to not sit down as it can be hard to stand up again. At each station, first thing to do is have another drink. It is also important to stop every 5 minutes or so just to breath in deeply for about 30-45 seconds. 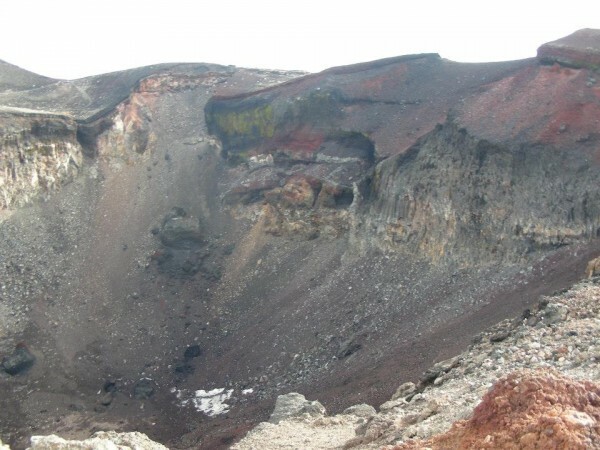 The highest point of the crater is at 3776 meters above sea level, and the air is very thin. The important thing to remember though is that less than 12 hours earlier, you were at sea level. Use your brain, don’t talk (too) much, but look after each other. The descent can be difficult, as the pumice and scree can make it hard to keep your footing. Good hiking boots (and thick socks, and a spare pair of bootlaces just in case) are needed to protect your feet, and a walking stick is very useful. In many ways, the descent is more difficult than the climb. It is also more painful. 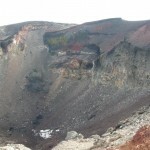 As you make your way down the mountain, the oxygen levels gradually improve, but until you descend into the thick cloud cover that usually covers Fuji, you need to be careful about ultra-violet light (especially if you have fair skin), and as it is now daylight, hydration levels need to be just as carefully managed on the way down as during the climb. By this stage most people are tired, and due to exhaustion can become careless about sunscreen, water intake and calorie intake, so your guide will remind you regularly to re-apply sunscreen, drink and eat. DO NOT wear headphones or earbuds! Leave them behind. Furthermore, a note here on night vision. Even though it is dark, aided by moonlight/starlight your eyes will adjust to the available light and you will be able to find your way and see what is around you. Be wise about using a flashlight, because the light will always destroy your night vision and you may end up with tunnel vision, making your hike more stressful than it should be. 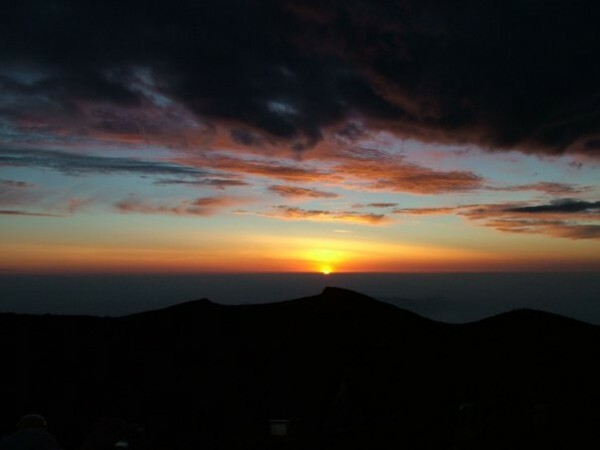 You will also miss out on seeing the stars, which are fantastic to see at high altitude. On Mount Fuji you are above the clouds, and there is very little light pollution at this altitude. 1) Proper hiking boots or thick soled walking shoes. These are a must. With spare pair of laces. Best to have hiking boots that protect the ankles. 2) Thick socks (woolen socks are best), and at least one spare pair in case of rain/mist. Put the spare pair in a waterproof bag. 3) Camera to record the experience. A light tripod if you are of the geekier persuasion. You really don’t want to climb this bloody hill twice. 4) Change of clothes. Or even two. You will feel better, especially if there is rain. You can leave a change of clothes in the bus, you don’t need to lug extra weight up and down that hill. 7) An umbrella. Useful for shade on the way down, but mostly useful for when rain becomes hailstones. Not so uncommon during summer when above 2600 meters altitude. Hailstones really hurt without an umbrella. 8) High energy foods such as sweets, nuts, chocolate (especially chocolate coated macadamia nuts. 100 grams of macadamia nuts provides a lot of energy – 3,080 kJ / 740 kcal, not including the chocolate, which even in summer will not melt due to the cold temperatures on the mountain). 9) Light (if possible Gortex) rain jacket and pants. 10) Plastic bags for rubbish (there are no bins on the mountain, everything has to be lugged up and down the mountain. 11) Sunscreen FP factor 15+. At high altitudes the sun’s UV rays are much stronger than usual, never hesitate to put it on. Problem is that due to perspiration it sweats off. Most of the time, a light cotton long sleeve shirt provides better protection. And at this altitude, you don’t need short sleeves anyway. 12) Sunglasses (especially if you have blue eyes). 13) Toilet paper and other toiletries. Bring a toothbrush & toothpaste. Useful if you have been vomiting. You will NEED 100 yen coins, as the toilets are not free. 14) Torch/flashlight and spare batteries. 15) Towel. The small kind. Useful to protect your neck against the sun, and more useful in an onsen after the climb. Just bring two! 16) Warm clothes (something with a zipper is better than a pullover. Layer your clothing. You get hot climbing, and then because your clothing will be damp due to perspiration, you freeze when stopping, or while waiting for sunrise at the peak). 17) Cheap disposable gloves. Don’t use good gloves, the mountain is a volcano. Gloves used on Fuji can’t really be used again. 18) The most important bit. Water bottles (suggest at least three liters for a night climb, at least 4 liters for men). Water on the mountain is expensive for obvious reasons, but you may need more. Also, remember that water is heavy. 1 liter is by definition 1 kilogram (2.204 pounds). Make sure you have enough cash for emergency purchases. You might need it, especially if the sun is intense during the morning descent. 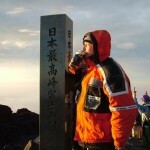 19) It is incredibly cold on the summit, especially if it is windy. Your perspiration during the ascent is such that your inner clothing becomes damp. Every time you stop for more than a few minutes, you begin to freeze. On some nights, especially during the early and late periods of the climbing season, the wind chill factor can be not only extremely uncomfortable, but also dangerous. Don’t take the risk. Invest in a low cost space blanket. The next aren’t things to lug up the hill, but important to note. 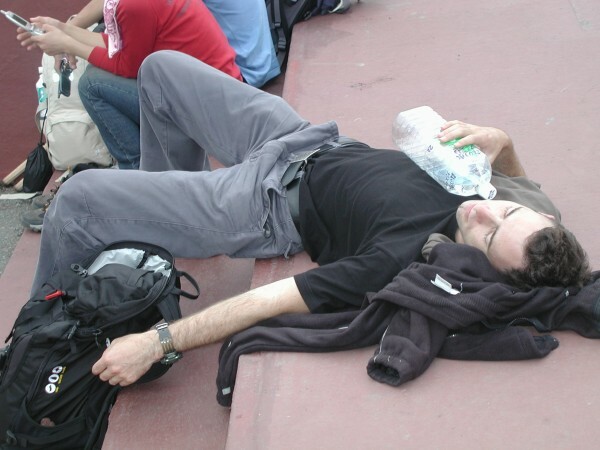 20) Don’t drink any alcohol at all during the 96 hours before the climb. 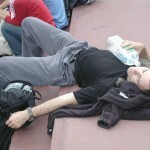 21) Start eating a lot of carbohydrates from at least 48 hours before the climb. You will need the energy. 22) There is absolutely no need to bring a hurley or a cricket bat. You will need to bring some cash. 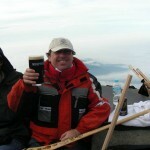 There is a fee for climbing the mountain, however this is already included in the tour fee. You will however need money (a roll of 100 yen coins is best) for the toilets, a walking stick, stamps etc, as well as for any emergencies. The huts on the mountain provide the only shelter available, and it costs 8000-10000 yen to stay in a hut, for just half of a tatami mat, regardless of the length of stay. We are not planning to use the huts, but in the past there have been circumstances (inclement weather or altitude sickness), where members of the climbing party have needed to stay in a hut. 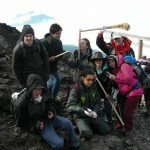 A traditional souvenir and climbing aid is a Japanese Mt Fuji walking stick. Along the climb, at each station, for Y200-500 each you can get a station stamp branded onto your stick as a memento of your achievement. The stick can be purchased at the starting point. 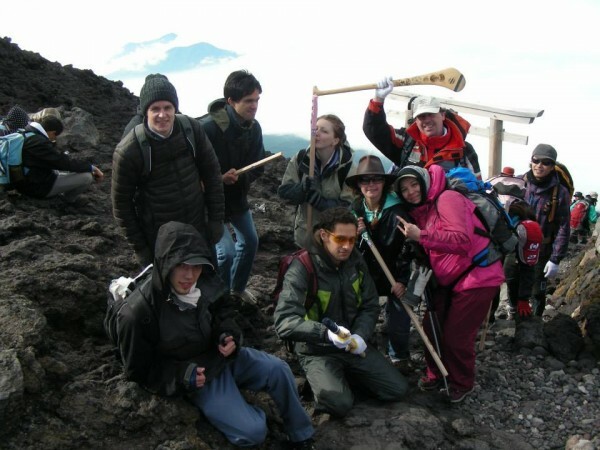 The walking stick comes complete with a Japanese flag and those irritating anti-bear bells (hence the absence of bear attacks on Fuji? No. There is no way any self-respecting bear would be on Fuji during climbing season). Getting ready to go home. Fortunately Monday is a holiday. Out of courtesy for your fellow climbers, it is usually a good idea to take the bells off before they beat you (deservedly) with your walking stick. The walking stick by itself is usually priced at 1000 yen, and depending on how many stamps you buy it can be quite expensive. Though it makes a useful pole for hanging your washing indoors on rainy days. Not bad? 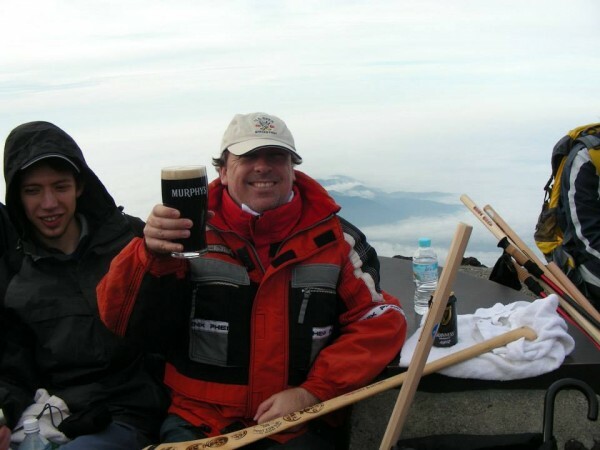 *Footnote: No of course there is no Irish Pub at the peak.